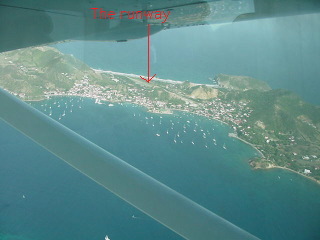 Wherein The Civilized Explorer team flies to Les Saintes from Pointe-a-Pitre and back. April 2000. We wrote about our visit to Les Saintes in 1996, when we took the ferry over. You may read all about it. 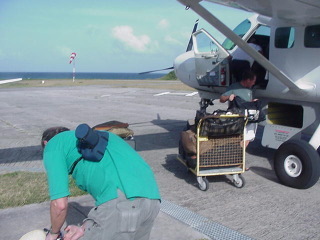 This year we flew from the airport at Pointe-a-Pitre. That has its trade offs, unfortunately. For the ferry, you just buy a ticket, climb on, get sick, then get off. Airports, of course, have other aggravations. We had bought our tickets ahead of time; round trip tickets for two persons cost us 856 FFr (we were getting just over 6 francs per dollar). We checked our baggage, which was weighed. We were asked our weight, but we had no idea in kilograms, so we were invited to step onto the baggage scales. Then we had to go through passport control -- no problem, just show the tickets to Les Saintes and get waved through -- then go through the metal detector and X-ray machine. Naturally, there is a line, as there is only one set of machines at that checkpoint. Finally, though, we got downstairs (no elevator) to the gate to wait for someone to show up. On Air Guadeloupe on Sunday, we had our choice of flying over at 8:00 am or 4:00 pm. Since we were coming from Basse Terre and had a rental car to dispose of, we picked the latter flight. Another couple had, too. Generally, the flights are set up for day- trippers. They are full going over in the mornings and coming back in the evenings. Eventually, a woman showed up and took us on a stroll to the aircraft, a single- engine Cessna 208B. Our luggage was stowed in the underbelly, and we climbed a short ladder into the plane. There were eight seats, four on each side of the aircraft. At the rear there was an area with a ridge across the interior -- we were instructed to put our carry on bags in that area, and a fabric "gate" was then attached across the fuselage to keep the stuff more or less in place. 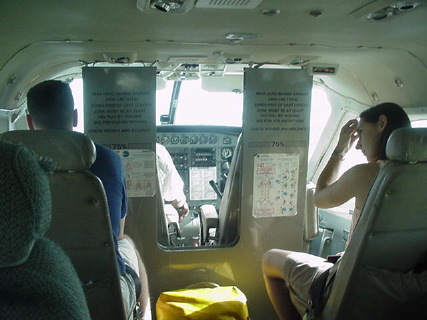 We all seated ourselves; lap belts only; the pilot separated from us by a couple of vertical structural beams. Off we went. The plane and the flight made all the airport aggravation worthwhile. We flew a circle around the tiny island for no apparent reason, getting great views all the while. Then we landed, got out, and strolled into the tiny waiting room. There was a man with a small cart with the luggage of outgoing people on it. He pulled the luggage out of the plane, dropping it on the ground, put the new bags on, then put our luggage on the cart. The pilot had gotten out, so he got back in and took off. 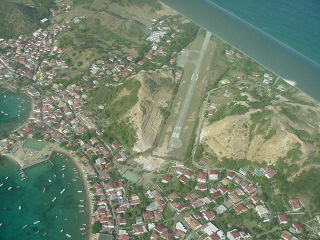 From take off in Pointe-a-Pitre to take off at Les Saintes was 20 minutes. Our trip back was the 4:20 flight, and there were 9 passengers for the 8- passenger plane. All baggage and passengers were weighed on the baggage scale (this one was a free- standing scale with a big dial at the top). The plane was late, not arriving until about 4:40. The luggage swap was performed, we got on in the front seats, dropping our carry on bags in the pit in back. 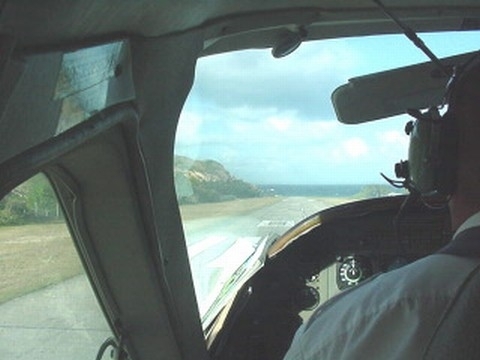 A girl was put up front as co-pilot; unfortunately, she had the worst view as the instrument panel was over her head. We climbed to our cruising altitude of a thousand feet and flew back to Pointe-a-Pitre. We had to go to the baggage carousel and get our bags, then we were off for our final night on the island. We have been asked for the schedule of flights over, and we refuse to give it. Schedules are subject to change, and we are not notified; if you presume our schedule is correct and it has been changed, the inconvenience may be that you miss your flight home. Generally, you may expect flights early in the morning and early in the evening. As we have noted, the bulk of the traffic to and from Les Saintes is people going for the day; we found no flights during the day between morning and evening. Be flexible; we gave ourselves an extra night on Guadeloupe just to avoid having something go wrong on the morning flight (about 8:20 returning to Pointe-a-Pitre) and cause us to miss our 2:20 pm flight back to San Juan. (Ferries are on the same schedule, by the way, so you really are out of luck if you miss the morning transportation.) On the other hand, we did see a couple of Americans who had flown back on the 8:20 flight and who were trying to figure out what to do until their 2:20 departure. On Sunday mornings, Guadeloupe is not a happening place.